Residents of Istanbul escaped from the heat by crowding all nearby beaches. Temperatures are expected to return to normal today. The heat wave currently gripping most of the country has pushed temperatures well above 40 degrees Celsius, forcing many to stay indoors instead of braving the deadly heat outside. 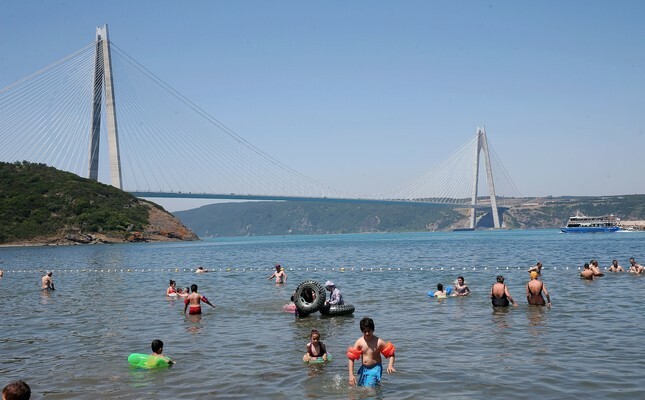 In Istanbul, people could be seen jumping into the Bosporus with their clothes on, while others who were more prepared went to the few beaches that dot the city's coastline. There were also those who could be seen lying next to sprinklers in public parks. While the temperature on Saturday was registered as 37.2 degrees Celsius by the Meteorology Department, the feels-like temperature, which includes the effects of humidity and wind, was reported at around 45 degrees Celsius. Still, compared to the southern Mediterranean coast, Istanbul had it good. In Adana, one thermometer in the Atatürk Park read 47 degrees Celsius in the afternoon. Most of the city seemed deserted as people escaped the heat, opting to visit nearby plateaus as others swam in the irrigation channels outside of the city. In Hatay province on the Syrian border, life came to a screeching halt after temperatures reached 40 degrees Celsius. In Balıkesir, south of Istanbul, temperatures reached 43 degrees, causing asphalt on the roads to melt. In Turkey's top tourism destination Antalya, the highest temperature was recorded at 45.4 degrees Celsius, the highest ever recorded since 1929, when records were first taken. Local meteorologist Davut Öztürk said temperature stood 10 to 12 degrees above seasonal averages. He said such record temperatures are anything but normal, noting that the average July temperature for Antalya is 34 degrees Celsius. He said temperatures will start to drop starting today, adding that temperatures in Antalya are expected to be a few degrees above normal throughout the week. Öztürk said temperatures in Muğla province on Turkey's southwestern coast were recorded as high as 41.3 degrees Celsius, just below the provincial record of 42.1 degrees. "The main reason behind this heat wave is the African hot weather front." In Adana, the hottest province in Turkey, there is one business owner who is not complaining about the rising temperatures. The city's ice factory is happy to have suddenly tripled its sales. Ice is being sold there in 13-kilogram blocks, which are frozen to minus 13 degrees Celsius with gaseous mania, a popular item among the sellers of bicibici, a local beverage made with shaved ice. The factory's manager, Reşat Karaca, said they were working at 100-percent capacity. "We sell 30 tons of ice every day because of the heat wave," he asserted. Erkan Bayık, a farm worker who came to the factory early in the morning, said: "We work from sunrise to sunset. If it were not for the ice blocks, we would be drinking water during the day." Ali Kişif, who also waited in line to purchase ice, said he purchases the ice blocks to go on picnics and for fishing trips. One of Turkey's most popular tourist destinations, Cappadocia, famous for its fairy chimneys and ancient underground cities, continues to attract a significant number of local and foreign tourists despite the heat. With temperatures at or above 40 degrees Celsius, many prefer to visit the underground caverns as an escape from the scorching heat. Sabrina Bessir from Singapore said she is used to the tropical heat in her native country but asserted that the heat in Cappadocia is on a different level. "Cappadocia is hotter than Singapore. I visit the underground cities to explore history and escape the heat for some cooler temperatures. I love Cappadocia, both for its nature and its history. I will tell everyone back at home in Singapore to visit this lovely place. However, I'll tell them not to visit during the summer but in the spring." South Korean Heo Seon Gjun said she does not like the heat, preferring instead to take a stroll through the man-made caves. "My friends recommended that I visit Turkey and many said I definitely needed to visit Cappadocia. Unfortunately, I was forced to visit during the summer months. Once I went underground to visit the unique city, I did not want to go above ground. Just walking around in these caverns where many people lived in the ancient past is amazing. They truly created something incredible and enduring."